UN new weapon to fight hunger + insects to food plate. The UN has new weapons to fight hunger, boost nutrition and reduce pollution, and they might be crawling or flying near you right now: edible insects. 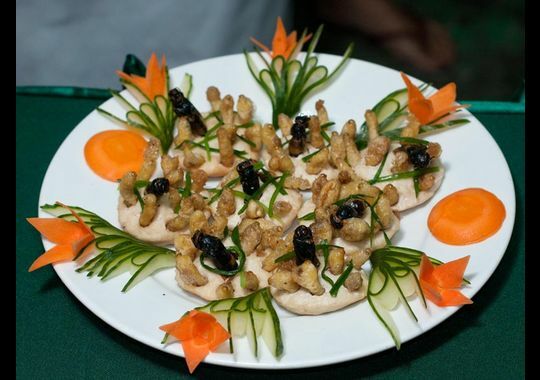 The Food and Agriculture Organization on Monday hailed the likes of grasshoppers, ants and other members of the insect world as an underutilized food for people, livestock and pets. A 200-page report, released at a news conference at the UN agency’s Rome headquarters, says 2 billion people worldwide already supplement their diets with insects, which are high in protein and minerals, and have environmental benefits. Insects are ‘extremely efficient’ in converting feed into edible meat, the agency said. On average, they can convert 2 kilograms (4.4 pounds) of feed into 1 kilogram (2.2 pounds) of insect mass. In comparison, cattle require 8 kilograms (17.6 pounds) of feed to produce a kilo of meat. Most insects are likely to produce fewer environmentally harmful greenhouse gases, and also feed on human and food waste, compost and animal slurry, with the products being used for agricultural feed, the agency said. Currently, most edible insects are gathered in forests and what insect farming does take place is often family-run and serves niche markets. But the UN says mechanization can ratchet up insect farming production. The fish bait industry, for example, has long farmed insects. Insect farming is “one of the many ways to address food and feed security,” the food agency said. “Insects are everywhere and they reproduce quickly,” the agency said, adding they leave a “low environmental footprint.” They provide high-quality protein and nutrients when compared with meat and fish and are “particularly important as a food supplement for undernourished children,” it said. The agency noted that its Edible Insect Program is also examining the potential of arachnids, such as spiders and scorpions, although they are not strictly speaking insects. University biologists have analyzed the nutritional value of edible insects, and some of them, such as certain beetles, ants, crickets and grasshoppers, come close to lean red meat or broiled fish in terms of protein per gram (ounce). The report noted that some caterpillars in southern Africa and weaver ant eggs in Southeast Asia are considered delicacies and command high prices. And some people who might not entertain the thought of consuming insects might already be eating them. Many insects are ingested inadvertently.